Glanhelyg was erected on Tyrhos Fields in 1859 for the Misses Webley-Parry of Treforgan, Llangoedmor, to the plans of “G. W. H.” of Treforgan. They were maiden sisters of Maria Webley-Parry, who had married William Owen Brigstocke of Blaenpant, Llandygwydd. In 1859-92 Ellen Webley-Parry lived here. In 1859-94 Eliza Jane Webley-Parry lived here. The following persons lived here in 1861: Ellen Webley-Parry, 47; Eliza Jane Webley-Parry, 42, her sister; and 3 servants – Joseph Richards, 33; Maria Richards, 38; and Mary Thomas, 28. In 1871 the following persons lived here: Ellen Webley-Parry, 56, landowner; Eliza Jane Webley-Parry, 52, sister, landowner; Joseph Richards, 32, married, groom & gardener; David Jones, 32, head ploughman; Mary James, 29, cook & domestic servant; Hannah Howells, 24, house & parlour maid; and Anna Richards, 30, occasional servant. In 1873 Miss Ellen Webley-Parry owned 63 acres with a rental of £45. From May 1876 Ellen Webley-Parry was a shareholder in the Cardigan Mercantile Company. In 1881 the following persons lived here: Ellen Webley-Parry, 68; Eliza Jane Webley-Parry, 63; Joseph Richards, 42, groom & gardener; Anne Richards, 25, Parlour Maid & House maid; and Anne Griffiths, 20, cook & dairymaid. In 1891 the following persons lived here: Ellen Webley-Parry, 76; Eliza Jane Webley-Parry, 74; Joseph Richards, 52, groom & bailiff; Mary Anne Davies, 20, servant; Anne Griffiths, 29, servant; and Evan Rees, 26, gardener. Ellen Webley-Parry died in January 1892 and Eliza Jane Webley-Parry died on 11th January 1894, aged 76, and Glanhelyg passed to Miss Constance Tyler (nee’ Webley-Parry). On 14th March 1894 there was a sale of furniture here. In 1896-1903 Gwinnett George Tyler, formerly of Gernos, lived here with his wife, Constance Tyler nee’ Webley Parry, and staff – Miss Jane Davies, Mr. J. Lloyd, Rachel Evans and Mrs. S. Rees. In April 1896 some alterations were conducted to the building. In September 1899 Glanhelyg was advertised to let. In 1901 the staff occupiers here were Owen Rees, Mrs. Sarah Rees and Miss Rachel Evans. In 1901 the following persons lived here: Constance Webley Tyler, 42, wife (b. Frankfurt, English-speaking); Jane Davies, 21, cook (b. Llangoedmor, bilingual); Rachel Evans, 30, dairy maid (b. Llangoedmor, Welsh-speaking); Alice Kirkham, 19, house maid (b. St. Dogmaels, bilingual); and Margaret Hughes, 15, parlour maid (b. Llechryd). In July 1901 the 5 bedroom house was advertised to let. On 17th January 1903 Gwinnett George Tyler of Glanhelyg died. On 23rd February 1903 and 11th January 1905 there were clearance sales held here for Mrs. Tyler. On 31st December 1907 Constance M. C. S. Webley-Tyler, widow, lived here. On 14th February 1908 there was a sale of stock and furniture here for Mrs. Webley-Tyler, who was leaving. Tenants then moved in. On 18th April 1911 Mrs. Constance Webley-Tyler, widow of George G. Tyler, died. Later Glanhelyg passed to Katherine Maria Antoinette Hope, wife of Admiral Herbert Willes Webley Hope since 1905, who had spent much of her childhood at Blaenpant. Mrs. Hope lived here in 1919. Rear-Admiral Herbert W. W. Hope and Mrs. Hope lived here in 1919-66. In April 1919 Admiral Herbert W. Webley Hope was awarded the D. S. O.. In 1923-25 Captain & Mrs. Hope were living away from Glanhelyg. In May 1924 Mrs. Saunders-Davies lived here. On 21st December 1927 the butler, William Nerrison, died aged 67. In August 1929 Rear-Admiral Herbert W. W. Hope’s daughter, Elen Hope, married David Heneker, composer. He later composed the music for ‘Half a Sixpence’ and other musical shows. In 1934 Benji Rees was the head gardener. 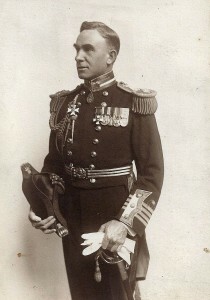 By November 1941 Admiral H. W. W. Hope was the President of the local branch of the British Legion. Rear-Admiral H. W. W. Hope and Mr. G. Davies-Jones lived here in 1950. On 9th July 1951 Mrs. Jacqueline Elizabeth Douglas, daughter of Admiral & Mrs. Hope, died tragically in Cyprus. On 8th May 1953 a Memorial Window was unveiled at St. Tydfil’s Church, Llechryd, in her memory. On 17th June 1966 Mrs. Katherine Hope, wife of Admiral Hope since 1905, died. On 26th April 1968 Admiral Henry Willes Webley Hope died aged 89. In 1971 the property passed to Peter Heneker, son of David & Elen Heneker. Peter Heneker was an executive of London Weekend Television and became the first organiser of CAFOD Wales and was honoured with the Knights of St. Gregory Medal by Pope Paul II. He married Josephine Ann Lewis-Bowen, daughter of James William & Kathleen Lewis-Bowen of Clynfiew. The Heneker family built a new residence on the estate and sold the mansion. The house became a listed building in 1994. The late porch was removed towards the end of the decade. 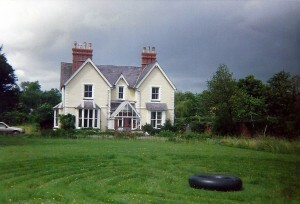 In June 2000 the 8 bedroom property was advertised for sale. 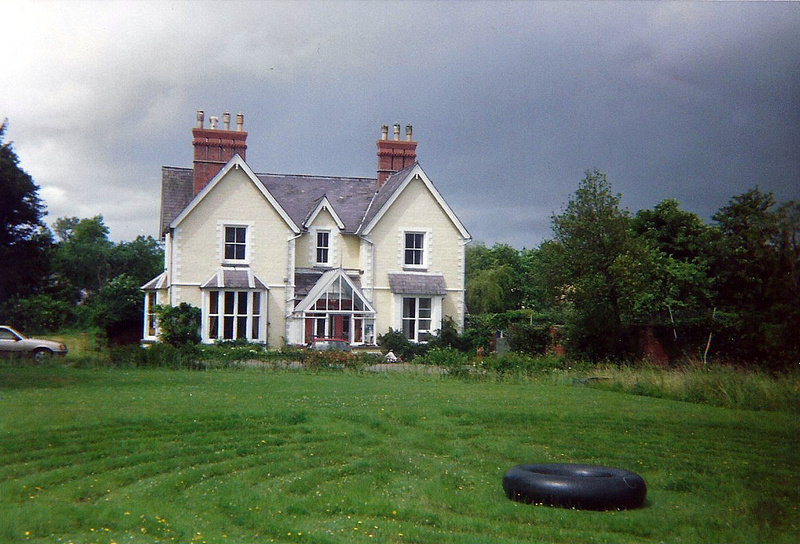 “…EXTERIOR – 1859-60 small country house built for the Misses Webley-Parry of Treforgan. Built oh hollow red terracotta blocks, L-plan in section, subsequently painted, slate roof and two red brick axial ridge stacks, 4-shaft to left, three-shaft to right. Two-storey three-window front with two projecting bargeboarded gables. Stone plinth with chamfered step, walls with raised rusticated quoins and similar rusticated first floor window surrounds. Raised string course. Front recessed centre has pent slate hood over half-glazed door with narrow window each side, and first floor narrow 4-pane sash breaking eaves under small gable. Gable bays have 4-pane first floor sash and bay window below, canted to left with slate hipped roof and square to right with pent slate roof. Large gabled glazed porch is added in front on painted plinth. W end has ground floor canted bay and first floor pair of narrow sashes. E side has gable to right with window above and two below. Rear centre gable with stairlight and varied windows, NE service range. Following my mother’s death I spent many school holidays with my grandparents at Glanhelyg. These were the happier days of a somewhat troubled childhood. The article mentions Benji Rees, whom I remember well; his wife, Ellen, also worked at Glanhelyg; I have vivid recollections of her many acts of kindness towards me. Like Calais and Mary Tudor, Glanhelyg will remain with me for ever but for different and more positive reasons. Dear Glen, This appeared in my in-tray today. I had not seen Mr Patten’s comments before, although they preceded mine by a little over a month. I suspect the answer to Mr Patten’s query lies among the Glanhelyg deeds held by Morgan & Richardson in Mary St, Cardigan, on behalf of the Heneker family. I rather Imagine that my grandmother, Katherine Hope, who inherited Glanhelyg sometime in the first 2 decades of the 20th century, was keeping her husband company in London (where from 1914 – 1917 he was in charge of the day-to-day running of the Naval Intelligence Dept.’s decryption service in Room 40 [the forerunner of Bletchley Park and GCHQ]) so the house may well have been let out during this period. The Webley Parrys and the Picton Evanses seem share a connection with Treforgan. Going off on a tangent, my father, a career officer with the Royal Artillery, told me that (presumably before WWII) the army had sent him to this neck of the woods to find a site on the coast for a new gunnery range and the place he recommended is Aberporth. Incidentally I am now very happily living by Troedyrhiw on the Cardigan – Tenby road. I went to the village school and shared a classroom with lots of other evacuee children. Coracles were widely used on the River Teifi. When the river flooded over the bridge, the local boys got an iron-tyred cartwheel and rolled it down the the bridge approach and into the water. They then fished it out and rolled it back in, again and again. Many of the boys owned an iron hoop which they bowled along, wherever they went, using a kind of iron hook. They also wore clogs. I was very envious and would have willingly swapped my brother for a pair of clogs and a hoop. The older children used to go out after school on organised rose-hip and blackberry picking expeditions. The blackberries were part of the next day’s school dinner. We also got to know a boy called Teifion who lived across the road from the end of the long drive into Glanhelyg. We used to walk into Cardigan for shopping. One day a coal cart stopped and gave us a lift. I can still remember being ‘swished’ in the face by the horse’s tail. Every morning on the way to school, I was passed by an open truck delivering Italian POW’s to work on the local farms. They all wore diamond-shaped patches on their backs. Two of them worked at Glanhelyg. I think one was called Alfonso. Sometimes they joined us at mealtimes. They were very friendly, but couldn’t speak a word of English. They showed us photographs of their children together with with locks of their children’s hair. Their orders were given by miming the required task. One day they were told to sweep the yard. They mistook the mimed sweeping motion for the very similar digging motion, and had dug up most of the cobblestones before anyone could stop them. Their next task was to put them all back! About this time, my brother John got into the chicken run and broke all the eggs. Apart from the chickens there were two pigs, bees and cows. We all got up at 5 o’clock one morning to see the cows being milked. I got to ride on the tractor when they cut the corn. The cornfield was cut in ever-decreasing circles driving all the rabbits into an uncut island in the centre. The local boys then dived in and caught and killed as many rabbits as they could. Glanhelyg had no electricity. Everything was done by gas. There was a gas fridge, and gas lighting. One night John and I started throwing socks at each other. Disaster struck when a sock hit the gas mantle. The mantle crumbled to dust. We knew nothing about gas mantles, and were terrified what our our hosts might say when they found out. For all we knew, we had just destroyed some irreplaceable relic. After a few nights lit only by the flame of a mantle-less gas jet, we owned up. There was no fuss, just relief all round. Mantles were very cheap and you could buy them in Cardigan. One intriguing feature of the house was a large box-like object suspended on a cable from a pulley high up on one of the walls. The other end of the cable went down to a hand-cranked winch at ground level. Every morning someone would wind the box up to the highest level and it would slowly descend during the day. I can imagine a similar mechanism driving Big Ben, but this one had something to with pressurising the the gas supply. I didn’t see it there when we revisited the house about 10 years later. There was a manservant called Messum who helped us with any problems. The Welsh language was spoken everywhere and Messum taught us the everyday greetings. My mother had somehow learned to express her disgust at anything by saying “ach-y-fi”. She used it with teutonic ferocity for the rest of her life. We knew there was a hazel tree in the grounds of Glanhelyg and when we got back home to Morden we wrote to Messum asking if he could send us some of the nuts. A few weeks later, a small sack of hazel nuts arrived in the post. It was very kind of him to go to so much trouble. I guess that Robin Douglas was only two or three years old at that time so we didn’t really get to play together. I can remember him once getting stung on the face by a bee, and that he always seemed to go around bare-footed. I wonder if he remembers us! In the mid 1950′s our family toured Wales on holiday. We called in at Glanhelyg quite unannounced, and were welcomed by Admiral Hope. We then visited the church in Llechryd and were shown Mrs Douglas’s memorial window. It was really sad to hear the news of her death. For some unexplained reason, after only a few months at Glanhelyg, my mother decided to take as all home. It was hardly a wise decision. The war was still on and the V1 flying bombs that we had come to Wales to get away from had been replaced by even deadlier V2′s. I was not at all happy to leave. For the one and only time in my life, I actually enjoyed going to school, and life on the the farm was never boring. Indeed I remember the evacuees being at Glanhelyg but sadly not much more about them. I also recollect the pows ( 2 Italians and 2 Germans but no more than one at any one time). It’s absolutely fascinating to read Peter’s recollections of my home so many years ago and I should be most grateful if you could pass my e-mail address on to him (I can’t seem to see his among all this electronic guff but I’m not very IT savvy. I wonder whether you managed to pass my e-mail address on to Peter Agombar; I’d very much like to make contact with him and he also seemed keen to reciprocate. Your Castell Aberteifi talk at Moylgrove the other evening was most enjoyable and informative. To find the book, enter Haliburton in the Author Box, or The English In America in the Title Box. Thanks Adam – I’ll take a look, and would happily recommend your site to other visitors of this page!